Neuropathy is an important long term effect in diabetic patients. Burning sensation, numbness, loss of sensation, muscle cramps, poor reflexes and sensitivity to pain are common complaints. Methylcobalamin, an active form of Vitamin B12, has been studied in many trials. It's role has well been established in the treatment of automatic and pheripheral neuropathy in both diavetic and non-diabetic patients. 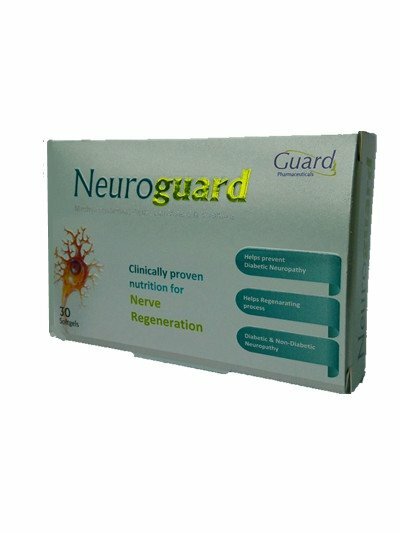 The combination of the nutrients in Neuroguard has been designed to compensively effect favorable outcomes in Diabetic Neuropathy patients. Suggested use: one capsule to be taken with your main meal.